Offers superb dexterity and comfort. Suitable for industrial applications or heavy vehicle operations. 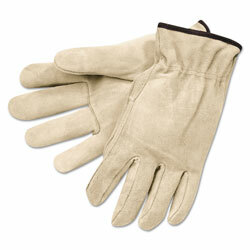 Style: Drivers'; Wrist Style: Shirred; Material(s): Cowhide; Elastic; Thumb Style: Straight. Attention California Residents. ⚠ PROPOSITION 65 WARNING: This product can expose you to Leather dust, which is known to the State of California to cause Cancer. For more information go to www.P65Warnings.ca.gov. Driver's Gloves from Memphis Glove! 40 In Stock today.